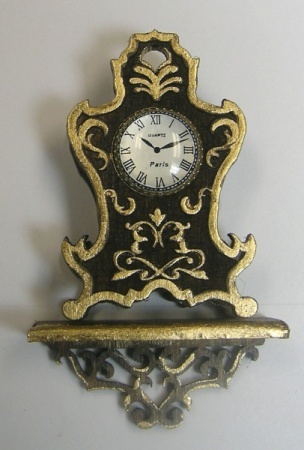 A simply yummy wall clock with lots of raised detailing perfect for gold gilt treatment. Face is darling with raised dome. Matching fretwork shelf. Clock alone measures 1 3/4 high. Clock and shelf measure 2 1/8" high. Easy to assemble, can be painted or stained.